Protected by a shark cage, Dr. Greg Skomal photographed this great white in the Guadeloupe islands, prime territory for sharks and researchers. Feeding off the coast of the Isle of Man, a basking shark sifts plankton out of the water column. Basking sharks are large but passive, and Greg, in scuba gear, got close. Photograph sharks? Well, yes—If you're a marine biologist with a special interest in sharks, it's what you do. If you're Dr. Greg Skomal, it's most likely what you were born to do. Ask Greg about his passion for the underwater world and his immediate response will include mention of "a guy named Jacques Cousteau, who had a weekly television show I fell in love with." And he'll mention films—Jaws, and Blue Water, White Death—and TV shows—Sea Hunt, and Flipper. And then he'll say, "I fell in love with the ocean by watching it on TV." Before long, though, the real thing came along: his family took a Caribbean vacation. "That was it—I could see my feet when I walked into the ocean. I could see fish and swim with them, and I wanted to show this to people." And so he began taking underwater pictures—the first ones with a Kodak Instamatic in an Ikelite housing—and presenting slide shows for his brothers and sisters. He studied biology in high school, and he learned to scuba dive. When he graduated high school his parents gave him a Nikonos III underwater camera. Then came the big decision: pursue marine biology or photography? "I decided to be serious about marine life," Greg says, "but to always try to have a camera with me. Which is how it's been for about 40 years." Coming in from Mexico from a research trip, the spectacular San Diego sunset and the lonely sailboat made for an irresistible photo op. Greg took this image of sunrise off the coast of Maine as he was heading out to do some shark tagging. While in college, at the University of Rhode Island, Greg started working at a lab in Narragansett where scientists were tagging sharks to track their movements. He learned to use their Nikonos cameras to document the field work. "The Nikonos was a great tool because there was no automatic—you needed to know all about shutter speeds, f/stops and depth of field," he says. "It was a great way for me to refine my skill set. I would go out on the research vessels and take pictures of the sharks and what the scientists were doing. It was like, 'This shark has a very strange parasite on its eye,' so I would go over take a picture. And, 'Look at this interesting tumor growth on the inside of its liver,' and I'd take that picture." Today those types of shots are still part of his work, but there are also pictures that aim for a purpose other than documentation. "I also try to produce photos that are pleasurable to look at and that inspire people—or at the least get their attention [with] more than just the science." The mission, he says, is to move from education to respect to conservation. "All too often scientists do work and publish it in peer review journals that nobody reads but other scientists. But I think that because most science is funded by the government, we have an obligation to share what we're doing with the public." And if scientists can effectively share what they're doing, he believes the public will become engaged. "And once engaged, they’ll become interested and start to show respect, and with respect for the environment comes protection and conservation. Clownfish in the Red Sea. Greg used flash to bring out the color of the fish and their host anemone. "I was probably 60 feet down," he says. A whale shark photographed on a tagging mission in the Red Sea off Saudi Arabia. "These are harmless sharks—no cage necessary." A great white, about to sink its teeth into the carcass of a seal, photographed from a boat in the Guadeloupe islands. "This is a great white shark in the Guadeloupe islands. It's heading up toward the surface because someone tossed bait in that direction. You can see a bit of its reflection off the surface of the water. I'm in a shark cage when I shoot pictures like this." Greg sites coral reef ecosystems as an example of the importance of sharks in a complex chain that sustains life in the sea. "Sharks act as top predators in a coral reef ecosystem," he says. "They tend to kill and eat grazers on the reef [so] everything stays in balance. If you remove sharks from that ecosystem—and this has been demonstrated in areas where sharks have been depleted—some of these grazers will overgraze and create problems for the reef itself. That could lead to the reef collapsing. If the reef collapses, then all the protection and food—everything it provides to all the other members of the reef—will cascade out of control, and that could lead to the collapse of that ecosystem. On a smaller scale, there is some evidence that removing the sharks will create an imbalance that is not healthy for the ocean. I absolutely believe that." 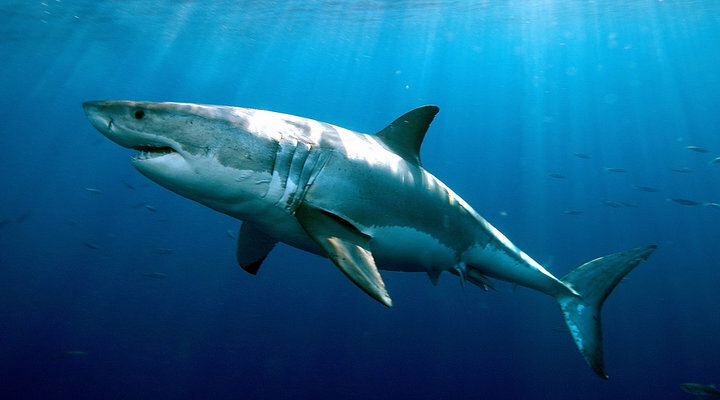 The number one threat to sharks, he adds, is overfishing. For the last 35 years, Greg has been tagging sharks to study their behavior—to see where they go and what they do. "Work we did with transponders and the AUV (Autonomous Underwater Vehicle) was at a very fine, high-resolution scale where we were looking at what they're doing from minute to minute, hour by hour. They spend 60 percent of their time away from us, at depth, where we can't see them. So if we can follow them we can spy on them and see what they're doing." New technologies allow sharks to be followed over greater distances and time spans. "We can put tags on them that'll transmit to us six months from now, and we can recreate their movements in three-dimensional space." How tracking benefits the sharks and their environment is pretty straightforward. "When you want to protect a species—and here in the US, where we do a very good job protecting animals, we're mandated by law to maintain populations of most creatures at sustainable levels—it's vital to know where that animal occurs in time and space. What are its movement patterns, its natural history? How fast does it grow, how many young does it have, where and when does it reproduce?" With this knowledge, scientists ideally will be the first to notice threats to the species. "We try to find out if something is happening that people are causing, or if something is happening naturally that changes their behavior or their motivation. Is what they're doing driven by simply the environment in which they live? Let's say, for example, water temperature, and they leave New England because it gets too cold. Or is it their desire for reproductive opportunities, or just to feed on a robust food source? Or are they going because they have no choice because we've modified the environment in some way? "These are all things we're trying to answer, and they're hard to answer. But we chip away at it." What he describes seems to be a simplified scientific method: find out what's going on, then try to find out why. "Yes," Greg says. "First what, then why. That's how it all starts." How it all started for Greg was with images—pictures on television, and pictures he took with a Kodak Instamatic so he could share what he saw and what he cared about. The D750 he uses today is capable of capturing stills and video that can carry a powerful message of awareness and concern. As Greg puts it, "If I can deliver my research through really nice photos, and tell a story, then I'm starting a chain of events that's critically important for the future. "That's what inspires me to take good pictures." "This is a common species of brain coral," Greg says. "I took the photograph in the US Virgin Islands, and it's one of my earliest Nikonos photos." A great white shark charges after bait in the Guadeloupe islands. "I loved the way it was slicing through the water and how the camera froze the motion of the water." A ring seal pup at Baffin Island in the Arctic Circle. "We were studying Greenland sharks up there when it popped up to say hello." A great white off the coast of Cape Cod. "Not a lot of photos of white sharks were taken there," Greg says. "It's a rare species for that area. It was swimming past the boat, turned and looked right at me. Some will come and check you out, others completely ignore you." A humpback whale in shallow water off Cape Cod. "We were following it closely and got great shots from the boat as it broke the surface." His first digital camera was a D200, and he still has it for backup and some land- and boat-based photos taken, most likely, with an AF-S NIKKOR 80-400mm f/4.5-5.6G ED VR. A D750 and an AF-S Zoom-NIKKOR 17-35mm f/2.8D IF-ED in a waterproof housing is his workhorse underwater rig. Dr. Gregory Skomal is a marine scientist working for the Commonwealth of Massachusetts. He has a master's degree in marine biology from the University of Rhode Island and a Ph.D. from the Boston University Marine Program. Google "Gregory Skomal TED talk" for his presentation on tracking great white sharks.